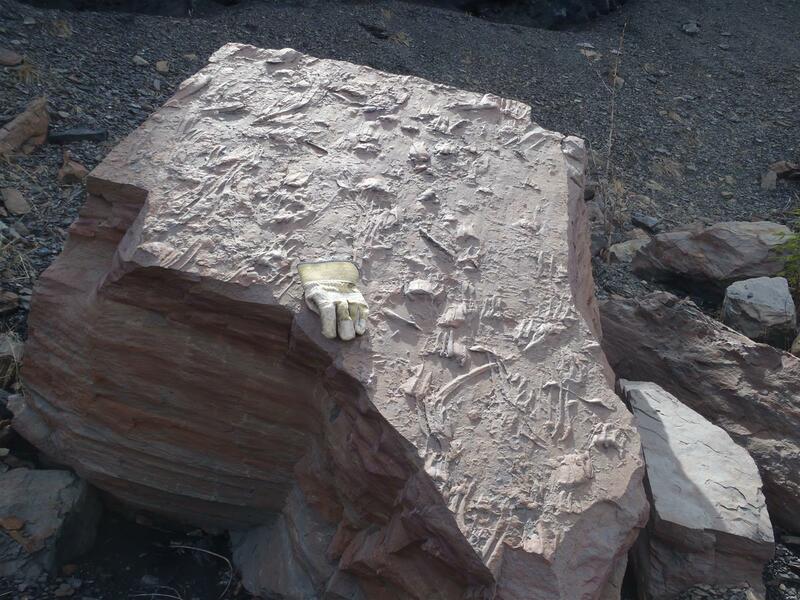 A discovery by an employee at Teck Resources Limited’s (“Teck”) Quintette Project, south of Tumbler Ridge in British Columbia’s Peace Region, has turned out to be one of the finest examples of fossil crocodilian tracks in the world. Geologist Kevin Sharman already has a string of important fossil discoveries to his credit in the area. When he encountered an intriguing series of large rock slabs in the mine on April 27th, 2015, he knew that what he was looking at was different and special. The discovery was reported right away to the scientists at the Peace Region Palaeontology Research Centre in Tumbler Ridge (the research arm of the Tumbler Ridge Museum Foundation). Museum staff (Richard McCrea, Tammy Pigeon and Linda Amos) began work on creating latex moulds of the four track-bearing slabs on May 11th. Before moulding the museum crew excavated some of the slabs to expose all of the surfaces. Hundreds of digital photographs were taken to create high-fidelity 3D computer models. Latex was applied in many layers over the next few weeks, and staff recovered the moulds on June 4th. This allows for the production of replicas of the track-bearing surfaces and the creation of an exhibit in the museum’s Dinosaur Discovery Gallery. The track-bearing rocks are from the coal-bearing Gates Formation, and are about 100 million years old. The two larger blocks have surface areas of up to two square metres and a mass of approximately 5000 kilograms each. Mine staff are planning on moving them from their current locality to the museum. Here they will be stored in the new collections building, specifically designed to house such large and heavy specimens. These crocodilian tracks are the latest in a series of internationally significant fossil trackway discoveries in B.C.’s Peace Region. Recent announcements have included the only tyrannosaurid trackways in the world and the “Dinosaur Autobahn”, a megatrackway site. Partly in recognition of this magnificent fossil record, the Tumbler Ridge Global Geopark was admitted to the Global Geoparks Network, supported by UNESCO, in 2014. One of 111 Global Geoparks worldwide , it is one of only two in North America and the first in the west. 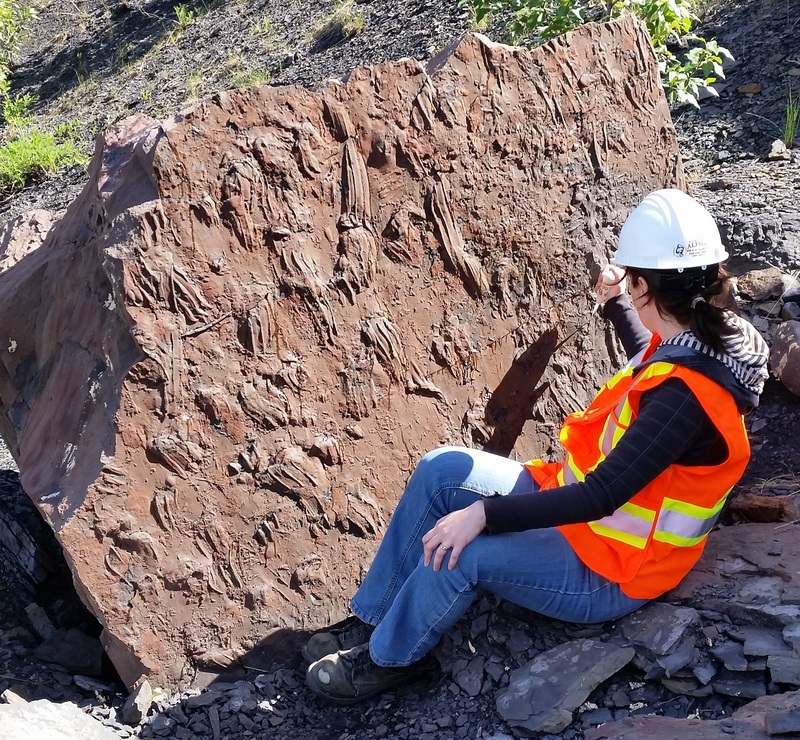 The Tumbler Ridge Global Geopark’s formal inauguration ceremony will take place on June 29th at the Dinosaur Discovery Gallery, where a replica of the newly discovered crocodilian trackways will be on exhibit. Guests of honour will include The Honourable Judith Guichon, Lieutenant Governor of British Columbia; The Honourable Shirley Bond (Minister of Jobs, Tourism and Skills Training), and Dr Godfrey Nowlan (Chair of the Canadian National Committee for Geoparks).